The battle over royalties and re-purposing rights for traditional material online has been going on for years. As the world becomes more user-driven everyday, advertisers and content providers continue to grapple with controlling how their content is consumed, shared and more importantly monetized. Yesterday online video and audio advertising took a step toward reality. Today is reserved for a standing ovation for my fellow Canadians. As a producer and broadcaster, I have always been vocal about the fact that whether you pave highways or write songs you should be compensated for your work. I have gone on record, written articles, and fought for artists my entire career. This goes far beyond downloading the new GNR for free. Until now, media and advertising companies had to pay additional online charges to re-purpose the same content created for traditional outlets. Online advertising and integration has become more than a $20 Billion industry in North America. In Canada, online advertising has surpassed radio in the last year. This is exciting news for advertisers, content providers, and traditional media. This gives all of us a wider swath in which to grow our content and talent. 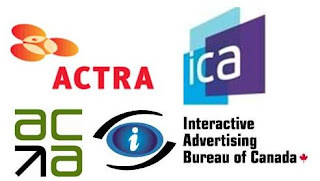 “IAB Canada encourages advertisers of all types who have been considering getting into either in-stream, rich media or over-the-page audio and video advertising, to take immediate action on these new pilot project rates, in order to benefit from video ad effectiveness in 2009 and beyond." You can read more on the IAB website or the ACTRA website. Now let's go create some great content and integrated relationships!